I'd never paid much attention to the little yellow wildflowers with the dull name of lesser celandine that pop up in my garden around March and April. To be honest, I thought it was probably a weed. 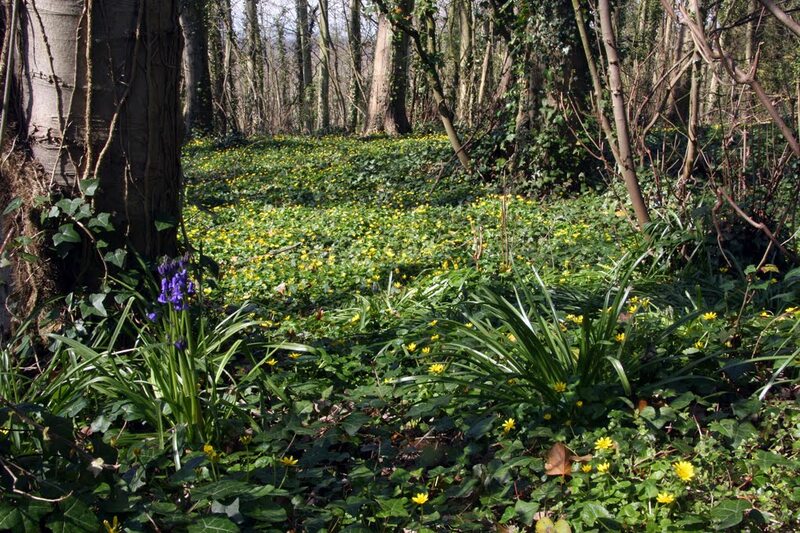 But when I went for a woodland walk and saw this carpet of lesser celandine covering the forest floor like dappled sunshine I realised how beautiful the flowers could be on a spring day. It prompted me to find out a bit more about the diminutive plant. According to the Oxford English Dictionary, celandine comes from the Latin chelidonia, meaning swallow: it was said that the flowers bloomed when the swallows returned and faded when they left. And according to Gilbert White, who live in the Hampshire village of Selborne around 1800 and wrote The Natural History of Selborne, the plants came out on in his village on February 21, but commonly flower from March until May, and are sometimes called the "spring messenger" as a consequence. So you can recognise it, lesser celandine is a low-growing, perennial plant, with smooth, dark green, heart-shaped leaves. It likes bare, damp ground. The flowers have pointed petals like a stylised sunburst. When it first blooms it has an orange tint, turning yellow as it ages. The Celtic name for lesser celendine is Grain, which means "sun". It was also associated with the sun because the flowers close up when the sun starts to set and open as the sun rises. Bright as the sun himself, 'tis out again!" Magically, lesser celandine is associated with fire, the sun and springtime. In folk medicine, the plant used to be called pilewort because it was used to treat haemorrhoids. The bulbous tubers of the plant, which look a bit like piles, were dug up in May and mixed with lard as an ointment then applied the place where, proverbially, the sun don't shine. It is also worth mentioning that lesser celandine is not the same as greater celandine. Lesser celandine is related to the buttercup, while greater celandine is related to poppies. Note: This is not medical advice. Always consult a qualified expert before taking any herbal remedy. That was such a lovely and interesting post. Thank you! looks lovely---where was the wood?? The wood is at Friston, in Sussex, not far from the Sheep Centre that I posted a slide show of last week. thank you---sometimes I do wish I had a car again! !